A new museum exhibit a London’s Design Museum celebrates the art of the Ferrari. The show, which runs until mid-April, 2018, is a celebration of Enzo Ferrari’s vision for automobiles. Its a vision that has always been glamorous, attracting actors and athletes like Paul Newman, Elvis Presley, Bridget Bardot, Sammy Davis Jr., Peter Sellers, John Lennon, Eric Clapton, David Beckham, and Floyd Mayweather. 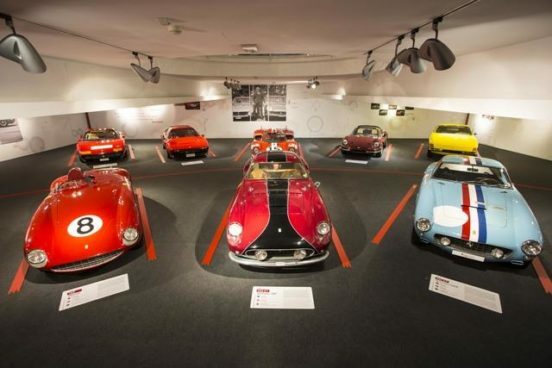 The exhibition focuses on exactly what gave Ferrari such incredible cache. It explores the company’s history, its forays into racing, its design and impact on pop culture. The Ferrari of the 1950’s and 1960’s was an elegant, premium experience. Ferrari cars were beasts on the race track. Enzo Ferrari didn’t even make his first car until he was almost 50 years old. 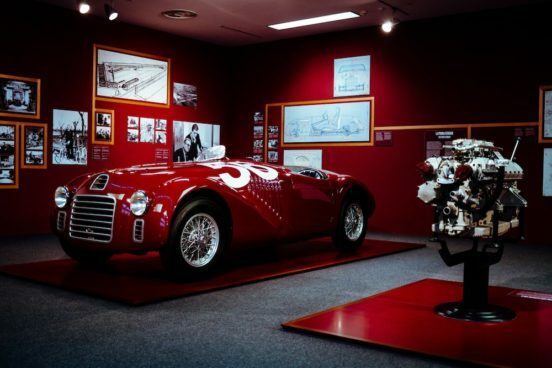 He was an experienced racer who also managed Alfas during the war. His first car in 1947 was the tipo 125. A series of exciting vehicles followed, such as the 166 MM, which is named for the famous race around Italy, the Mille Miglia. Ferrari won the 149 version of the race with driver Biondetti. The Design Museum show will appeal to almost everyone, from artists and designers to car enthusiasts. Visitors can see every aspect of car design, starting with sketches and drawings, moving to models, and then to the handmade clay mockups. A fascinating experience is getting to see the process of doing wind tunnel experiments. Ferrari’s wind tunnel was once a closely guarded secret, designed by Pompidou and Shard architect Renzo Piano and opened in 1997. The exhibit includes a wall of every Ferrari yearbook since the company’s launch in 1947. Ferrari issues exquisite yearbooks that feature flawless graphic design showcasing the cars. Enzo Ferrari was detail-oriented and hired the best graphic designers he could find to create engaging annual books, which are now coveted by collectors. Ferrari was always on the cutting edge of technology. One of the newest cars on display is from Maranello, a LaFerrari Aperta on loan from the cocky bad boy of the kitchen, Gordon Ramsay. 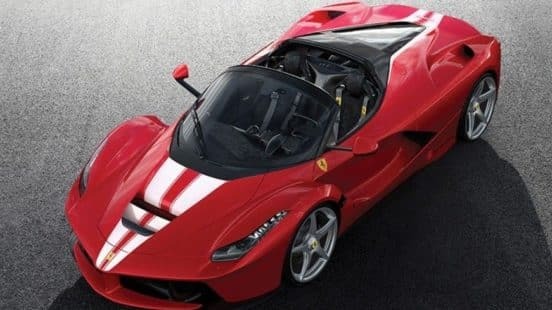 Only 209 Aperta’s were made, making it a highly coveted machine. The Aperta is the most advanced vehicle ever built by Ferrari, made to celebrate the company’s 70th anniversary. The show features some of the most famous and gorgeous automobiles built by Ferrari. The 1967 275 GTB 4 was closely associated with celebrity, most especially Steve McQueen. In addition to the car, the exhibition features photographs of other screen icons and their GTBs. A picture of Paul Newman from 1976 shows him posing on the hood of his 308 GTB, which is surrounded by hundreds of Ferraris-in-progress at the Ferrari factory. Clint Eastwood is shown alongside a 365 GT4 BB from 1976. Hollywood lore says that Eastwood was paid for his appearance in The Good, the Bad and the Ugly with a 1967 model. Another exciting display features the Ferrari 250 GTO, which won the 24 Hours of Le Mans GT class in 1962, driven by Pierre Noblet and Jean Guichet. 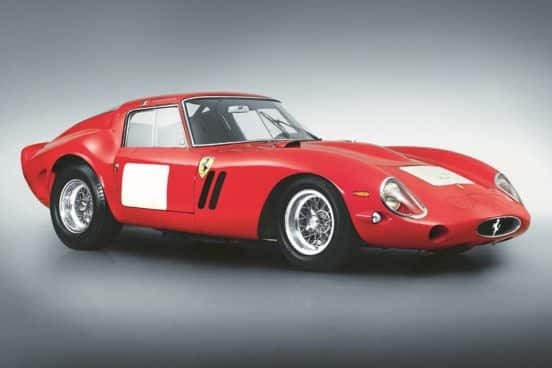 The car represents the pinnacle of Ferrari 250 GT series for the racetrack. Those who are interested in the exhibit have until April 15, 2018. Admission is £18,and the beautiful exhibition catalogue is £39.95.